We’re taking a peek inside the classroom to offer students a sampling of what they might experience. 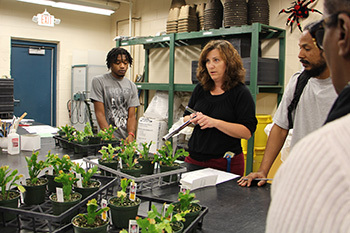 This week we visited a horticulture lab to see learning in progress. 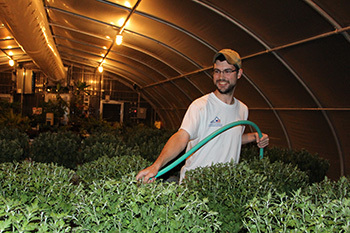 Horticulture students in Greenhouse Crop Production 1 (HRT 121) gain hands-on experience and classroom instruction in the art of growing foliage, bedding plants and floriculture. They learn about production requirements, environmental control and management and cultural techniques. They also gain insight into career possibilities in the industry. Don’t miss a lab! The majority of the activities are one-time only and there is always something new to learn. 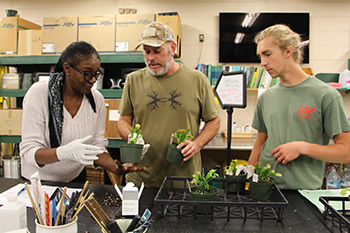 An alumna of the TCC horticulture program, Tomlin went on to earn her bachelor’s in horticulture and master’s in agricultural education from Virginia Tech. After working in landscape sales and installation, she joined Chesapeake and Virginia Beach Public Schools teaching horticulture classes, including greenhouse production, floral design, turf management and landscape design and management. She was also a horticulture extension agent with Virginia Tech in Norfolk. She joined TCC as a full-time faculty member this year.